We’d love your help. 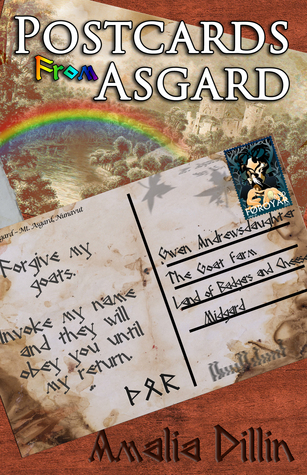 Let us know what’s wrong with this preview of Postcards from Asgard by Amalia Dillin. Magic goats are a lot more trouble than they're worth. Ordinarily, Gwen likes goats, even makes her living by milking them, but these two are some kind of devil-spawn, and one of them is pawing the ground, horns aimed at her guts. The fact that they were followed by a blonde farmhand with a much too charming smile isn’t all that much of an improvement, either. But Thjalfi ma Magic goats are a lot more trouble than they're worth. But Thjalfi makes himself useful. He's lean and smart, with a warmth in his pale blue eyes that makes her shiver, and she can't deny that he has a way with her horses. He seems to have a way with her, too. There's just one problem: Thjalfi's a slave, a bondservant to the god of thunder, Thor, and no matter how far they fall in love, he can't stay. To ask other readers questions about Postcards from Asgard, please sign up. New adult fantasy/mythology is decidedly outside my usual stomping grounds, but that didn’t stop me from enjoying this charmingly amusing play on Norse mythology. At one hundred and eighty-two pages, the book is a quick read that highlights the author’s humor and creativity. The romance is swift to develop, but I found the characterizations well-drawn and liked how Dillin used the story to showcase her take on the ancient legends. this is a cute short story. Supposedly Thor's war goats have gotten loose and he sends his hunky servant to collect them and right any wrongs. And the postcard delivers the messages to and from Thor to Gwen. It is really quite diverting and to read how Gwen handles this or not is funny. But in the end she become a believer and we all get our HEA. I love Norse mythology and retellings so I was thrilled to be given an ARC to read and review. Author Amalia Dillin had me at the dedication. Because Thor. That hammer. Right?! No doubt. As I dove into Gwen's story I found the writing to be clear, concise, and crisp. There weren't any wasted or frivolous words which made reading highly enjoyable. Dillin painted a world rooted in our own and colored with the fantastical. The magic woven through out was beautifully done. I loved Gwen's world; her I love Norse mythology and retellings so I was thrilled to be given an ARC to read and review. I loved Gwen's world; her big sky farm life, grit, and stubborness. She came across as authentic and lovable. Then there was Thjalfi- dreamy and brawny and he cooked. Humor kept the mood in check. Dillin also skillfully incorporated the pronunciation coaching for the Norse words into the story broadening the reading experience. I am in love with Amalia's writing. Everything of hers that I pick up I don't want to put down until I'm done with it. This book was no exception. It's a short read, but it doesn't feel incomplete or underdeveloped like many novellas feel. I love the characterization, the goats, the postcards. A fun read that's totally satisfying. Ha! This was a cute novella. I'd give it a four, except that I'm not a big fan of "love at first sight, let's get married" - even though it does work for the story. Loads of Norse fun, plus goats. You can't go wrong with goats. Postcards from Asgard was charming. I was amazed at how much I learned about goats, farm life and Norse gods. I'm excited to read more from Amalia Dillin. I still love this novella. It's exciting to go back and reread and still love and be proud of a thing I have written. If you can read this and not fall head over heels in love with Thjalfi and/or Gwen, you are clearly a stronger person than me. As with all her books, Amalia's characterisation leaps off the page/screen. Reading her words is like watching the best kind of movie. She knows just how to fire your imagination. I loved it! I really got involved with the characters and enjoyed experiencing their adventures with them! Cute little story with a fun twist in the form of the postcards. Thjalfi is a minor character from the Prose Edda (and an even more minor character in the Poetic Edda) but Dillin took the character and definitely made him her own. She turns him into a charming farmhand who surprisingly turned out to be a deep thinker and loyal. Not to mention he sounds easy on the eyes. Gwen is a hard working farm-girl who is as stubborn as the goats she milks. She’s completely independent and comfortable with her lifestyle tending to her goats, horses, chickens, and cats. Th Thjalfi is a minor character from the Prose Edda (and an even more minor character in the Poetic Edda) but Dillin took the character and definitely made him her own. She turns him into a charming farmhand who surprisingly turned out to be a deep thinker and loyal. Not to mention he sounds easy on the eyes. The two characters as a couple are very well matched. Thjalfi is very giving and Gwen is very stubborn which makes for an interesting pair. The romance starts off tentative but turns sure and sweet. The goats, Blender and Masher, sealed the deal for me. They are horrible, demonic monstrosities that add so much humor to the story and actions cause emotional situations between the characters that I couldn’t help but love the beasts. Dillin also incorporated a small guide to pronounce Icelandic/Norse words without it sounding like an information dump! Information dumps are hard for authors to avoid when need-to-know information has to make the story and somehow still be seamless. Overall, Postcards From Asgard defiantly satisfied my love for Norse Mythology and in a modern, non-superhero fashion! I recommend this to anyone who is a fan of the old Norse myths and wouldn’t mind hearing them with a twist, or for paranormal romance readers in general. Thor is so yummy :) I have enjoyed this story through several edits and I still love the goats. A very sweet novella. I'm not a huge fan of instalove but it's hard to have it another way in a romance novella. I love her stories. Good character development, nice plot lines, good flow. My only complaint was that I was checking my progress on my kindle and it looked like I was at 75%. Then all of the sudden, the story was over! The rest of the book was excerpts from the author's other books. I was left wanting more. Fun little romp, though the MC rather made me roll my eyes a lot. Eh, for a fun little book I snagged as a freebie, worth the day of intermittent reading time. Amalia is the author of the Fate of th Amalia Dillin began as a Biology major before taking Latin and falling in love with old heroes and older gods. After that, she couldn't stop writing about them, with the occasional break for more contemporary subjects. She lives in upstate New York with her husband, and dreams of the day when she will own goats--to pull her chariot through the sky, of course. Amalia is the author of the Fate of the Gods trilogy, and the Orc Saga, beginning with HONOR AMONG ORCS. She also writes historical fiction under the name Amalia Carosella.